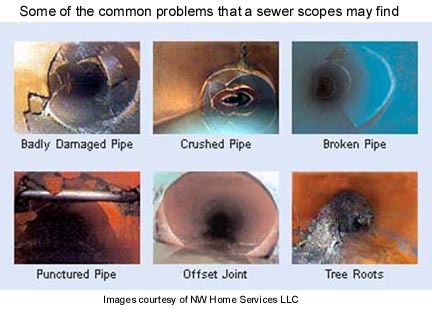 Is a sewer scope a good idea? I always tell our clients that are buying an older home it is. The company you hire is very important. Don't hire the companies that also repair sewers. At $5000 to $25,000 for a major repair, it is cheap insurance. Ask if they pull toilets if necessary. We were on an inspection yesterday and the scoping company would not pull a toilet, and could not get his camera all the way to the street sewer. The customer paid $250 (too much) for marginal service and still has no idea if the sewer is okay. If you need a referral for a quality company, give us a call, we work with them all the time. 1)Sewer snakes, root growth inhibitors, and excesive drain cleaners. 2) If there is a sewer cleanout and the cap is different from the rest of the plumbing, (ie a rubber expansion plug in a cast iron drain) instead of the original brass cap, there had likely been work done on the sewer lines. 3)Look for stains at the floor drains in basements, foul odors, and tags from a sewer cleaning companies. 4)Sinkholes in the yard and movement of the soils, especially for steeply sloped lots. We recently got a note from a client after they had a sewer check after we recommended it. This home was 100 years old and they had 4 bottles of drain cleaners in the basement. He said, "We used (a recommended vendor) per your recommendation (and suspicion during the inspection). It revealed a ~$1,500+ issue that could have turned worse down the road, so it was $195 well spent."